Published on April 23, 2012 by Wade Shepard Follow me on Twitter here. 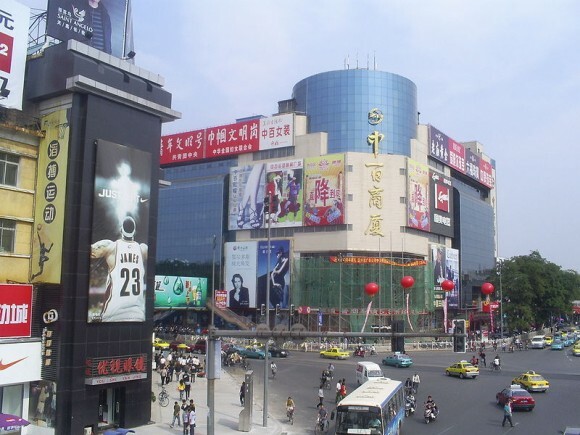 TAIZHOU, China- When I think of shopping malls I think of sparkling white tiled floors, sharp looking, new smelling middle class shoppers, air conditioning, and fixed prices that are clearly marked on every item. So it was a slight surprise when I learned that I could get a lower price for many items in Chinese shopping malls that what was printed on the tag. I was shopping with my wife for a new handbag. In Asia, these over glorified purses are status symbols and no self respecting woman would be caught dead walking around with some cheap-o, torn up, falling apart one attached to her shoulder. This is exactly the kind of purse that my wife had been hauling around. She is working in China, interacting with people, doing a job that demands respect. She must acquiesce with the parameters of the culture she is working in to some degree. In the USA looking like a poor slob by choice is sometimes seen as cool, and cool carries it’s own brand of status. In China, poverty is too real to be romanticized. My wife bought a couple new sets of clothes, high heeled boots, but her handbag appeared to be bio-degrading as she carried it — pieces flying off everywhere. My wife cares little for status or for status symbols, but all too often status = respect. Especially in the newly risen middle classes of the world. It is my experience from having a wife that a purse is an item that is either of crap quality or extremely expensive just about anywhere in the world. We were looking for good quality at a good price and found ourselves in a black hole of shopping — going everywhere but getting nowhere. We scoured the little street shops, the markets, and malls just to find the same results: they were either too crap or too expensive. But we were also unquestioningly judging prices by what was printed on the tags. Then one time I was looking at a putrid, puke colored brownish purse. I picked it up and admired its gut retching hues. The sales lady hurried over and began buggering me. To get some personal space I asked how much it was. To my surprise the lady dug into one of the purse’s pockets, removed the tag, and then ran over to a calculator at the checkout desk. She returned with a price that was less than half of the ticketed price. I tried this again with a less disgusting looking bag to similar results, then again. Just about all of the seemingly super high priced purses in the shop were actually being sold for roughly 50% off the ticketed price. Then I went across the mall to another shop, picked up another handbag, and asked the sales girl how much it was — even though the price tag was plainly visible. The girl went running for her calculator and ticked me out a price that was vastly less than what was on the tag. There were no sales signs, nothing to visibly indicate that the prices were anything other than what was on the tags . I soon found that I could ask for the “real price,” request discounts, and haggle for big ticket items in shopping malls in China. It was only my presupposed notion that prices are fixed in shopping malls that prevented me for inquiring about lower prices before. I thought of all the items that I just handed over the ticket price for throughout my time in this country and felt like a jackass. I eventually found a handbag for my wife, got a discount on it, went to pay just to realize that I was roughly nine RMB — $1.50 — short. I told the girl that I would give her all the money I had but it was slightly lower that what she rang up on the cash register. This confused her for a moment, but then one of her co-workers rushed to her aid, picked up a calculator, and ticked out a new price that was even lower than what I tried to pay. I left the store with a handbag and a little cash in my pocket. In China, there is the way things are on the surface and then there is the way things really are. Two different realities that somehow work together in tandem without contradiction. I will never figure this country out, but what I do know is that when after a big ticket item in a Chinese shopping mall the price tags are sometimes just smokescreen: bait for suckers. The price that you could actually pay is often vastly less.